The first two are excellent ways to improve your swimming speed and efficiency. However the third only makes you slower and less efficient as you slow down between strokes and then have to re-accelerate on the next stroke. This is doubly the case in open water swimming where waves and chop slow you down even more during the deadspot in your timing. Within our Swim Types system, an Overglider is a swimmer who has added a distinct pause-and-glide into their stroke to try and make their stroke as long as possible. If you're an Overglider you're probably an intelligent and diligent swimmer who likes to use a thoughtful approach to swimming. You have likely read on the internet or in books that gliding as far as possible after each stroke is what defines a great swimmer. Taking fewer than 40 strokes per 50m is often held up as a benchmark where true swimming efficiency begins, however this disregards the achievements of Olympic medallists such as Janet Evans, Laure Manadou, Lotte Friis and David Davies who take between 42 and 55 strokes per 50m. 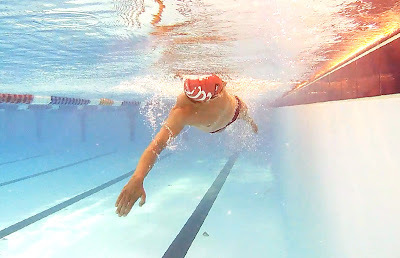 It also ignores the fact that nearly all elite triathletes and open water swimmers use a shorter punchier stroke style to give them great speed and efficiency. it by adding a pause-and-glide into your timing. The truth is that swimming efficiency isn't created by gliding, it's created by lowering drag and improving propulsive technique (1 and 2 above), which may or may not result in a long stroke style depending on the individual swimmer. This is the true perspective we need when considering swimming efficiency and explains why great swimmers use a vast range of stroke lengths depending on their body type, build, natural style and the environment in which they are swimming. Equating stroke length to efficiency is a gross oversimplification of the truth because any swimmer can lengthen their stroke by gliding but will harm their efficiency by doing so. If you've added a pause-and-glide into your own stroke you'll know this is the case as you will have hit a plateau that you cannot get off. You may also have had the experience of getting slower and slower as you try and lengthen out your stroke more and more. Gliding has taken you down a cul-de-sac with your stroke and the only way out is to bite the bullet and remove the deadspot to create a more continuous rhythmical stroke. While Overgliders are not normally aware they are showing the palm forwards, pressing against the water's resistance in this way helps pause the stroke at the front which is something they are deliberately trying to do in order to glide. Many view this period as an opportunity to "rest between strokes" but given that water is 800 times more dense than air, all they're actually doing is decelerating. 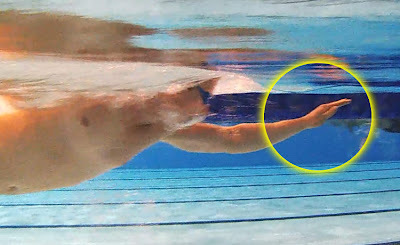 This fundamental link between gliding and a poor catch is one of the reasons Swim Smooth are so opposed to teaching any swimmer to pause and glide, even beginners learning the freestyle stroke. It also explains why improving the catch is critical to help any Overglider remove the deadspot from their stroke timing. If you are a recovering Overglider you may have tried to develop a better catch technique but found it difficult to do. By swimming with the palm facing forwards at the front of the stroke you are used to feeling the water pressure on the palm of your hand and might be misinterpreting that feeling as a good catch. By correcting your hand position you will actually feel less pressure on the palm which can feel "wrong" and like you're "slipping the water". Our Catch Masterclass DVD is our dedicated coaching program to improve your catch technique (and so remove the deadspots from your stroke timing). It's the perfect development program for Overgliders, containing all of Swim Smooth's visualisations, drills and methods to improve the key thing holding you back in the water - your propulsive efficiency. technique underwater - shot using our fantastic HD filming rig in Perth. Last weekend we were joined by Olympic Medalist Cassandra Patten on our Coach Education Course in Ireland. Having recently retired from swimming, Cassie's already developing into a fantastic coach and joined us in Limerick to find out more about Swim Smooth's coaching methods. This extreme level of flexibility allows her to produce good propulsion from her leg kick, so much so that she can kick in the region of 70 seconds for 100m with a kick board. A lot faster than most readers of this blog will be able to swim full stroke for 100m! This is all very interesting but what should you be looking for with your own ankle flexibility? Studies have shown that even the great Ian Thorpe (who was famous for having an extremely powerful leg kick over 200m and 400m) only developed 11% of his propulsion from his leg kick . For most of us racing over longer distances without the flexibility of an elite swimmer, it is unrealistic to generate significant propulsion from our leg kick. If you have poor ankle flexibility some simple stretching exercises are well worth adding into your routine to increase the range of motion of your ankles. If you are already flexible don't go overboard with this, whilst extremely flexible ankles are a useful attribute in elite pool swimming they will leave you vulnerable to ankle and lower leg injuries, especially when running. 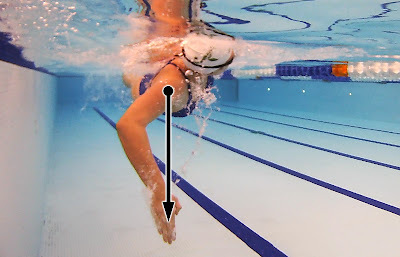 If you can point your foot in line with your leg that's plenty of ankle flexibility for adult swimmers and triathletes. Hold this stretch for 30 seconds at a time and only apply a light pressure. Developing your ankle flexibility will take many months and shouldn't be rushed. Treat it is a long term project but along the way you will notice every small improvement benefits your swimming. Again, hold for 30 seconds at a time and never force the stretch. If you suffer from any sort of knee pain or injury do not perform this one as it places a little load on the knee joint. In the Swim Smooth squads we make extensive use of fins when performing drills. Not only do the fins give you good support to focus on improve your stroke technique but they also gradually stretch your ankles at the same time. Used regularly during drills sets fins can make a big difference to your ankle flexibility as the months go by. We recommend mid-length flexible rubber fins such as these as they provide greater support and propulsion than the shorter zoomer style fins, allowing you to relax and focus on the drill. A special thanks to Cassie (@CassiePatten) for letting us share her feet with the world(!) also a big shout out to Alan Ward and all the staff at the University Arena for making us very welcome at their fantastic venue in Limerick. Toussaint, H. M., Hollander, A. P., de Groot, G., Kahman, R., & van Ingen Schenau, G. J. (1990). Power of leg kicking in front crawl swimming. In N. Berme & A. Capozzo (Eds. ), Biomechanics of Human Movement (pp. 456-459). Worthington, Ohio: Bertec Corporation. On last week's blog we talked about how pro triathlete Joel Jameson has made big strides forwards with his swimming by breathing to his non-dominant side. We had a huge response to the post and we know a lot of you have been experimenting with breathing to your 'bad' side to great success. If you have a strong preference to breathe to one side when you swim, try one of our favourite drill sequences below, we call it the Javelin Drill. It's a simple but powerful way to help you open up the 'bad' side of your stroke and develop the timing of breathing to that side. We often use this sequence during session warm-ups in the Swim Smooth squads. Wearing fins, grab a single paddle and place it on one hand - a conventional strapped paddle is fine but we like the Finis Freestyler for this purpose as it is arrow shape and the keel gives you feedback on your alignment. Push off and kick on your side with the paddle on the lower hand outstretched in front of you. This is like our conventional side kicking exercise (see here) except you are wearing the paddle on the lead arm. Make sure you are at 90° on your side with your rear hand placed gently on your thigh. 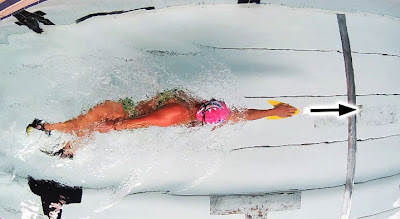 Once you get the feel of this drill on both sides (swap the paddle to keep it on the lead hand), perform it for 25m and immediately go into your full freestyle stroke, breathing away from the paddle on every stroke. So if you kicked on your right side with the paddle on your right hand go into full freestyle but breathe only to your left side on every stroke. As you stroke and breathe away from the paddle, let the breath take care of itself and maintain your focus on the lead arm. 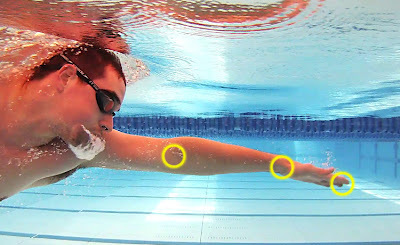 Visualise your arm like a javelin spearing straight forward with perfect alignment down the pool - this improved alignment whilst breathing is the focus of the exercise. How does it feel breathing to your bad side? The drill should help you rotate much better to that side and the paddle give you a greater awareness of your catch whilst breathing. Joel Jameson is a professional Ironman athlete with a fantastic bike and run pedigree, including running a 2:42 marathon off the bike at Challenge Henley last year. But until recently his swimming hasn't been where he'd like it to be. Joel's been training with Swim Smooth in our elite squad in Perth under Paul Newsome's tutelage and has been making some large strides forward with his swimming. Over the last couple of months we've reduced his 3.8km open water time from 58 minutes down to 52:15 and he's rapidly closing in on his goal of a sub 50 minute Ironman swim. Despite Paul's encouragement, Joel resisted getting used to breathing to his right side as in his own words it "felt awful and also it felt super slow". "It's starting to feel a lot more natural the more I use the right side (my wrong side)... The biggest change is that it has been proven to me that it is faster! That changes your mental ability to make the changes and it breeds positive progress. I have tried many times to change the side I breathe to but until coming to Perth I had never put a clock to it. Any athlete, pro or amateur, is looking for quick gains in performance. Buying a nice piece of kit is the quickest gain but often the most minimal. This change in my swimming although it seems an obvious one is a revelation of just how much quicker I can go. It has all happened over a relatively short time period too. 3 months of consistent work and it has proven to be fruitful. To swim 50 sec quicker in 1 week over the same distance and same conditions just because I was bold and tried swapping sides in a time-trial... Well worth the focus and persistence!" In an ideal world everyone would be able to breathe equally well to both sides and to encourage this we recommend bilateral breathing to most swimmers. In some instances though the best route for a swimmer may be to switch sides completely, as we have seen with Joel here. For tactical reasons Joel can now swap sides whenever he needs to. If there's waves, chop or bright sunlight to one side he can swap to the other. Or if he needs to keep an eye on another competitor and draft to the side of them, he can breathe to that side to judge his distance accurately. If you have a strong preference to breathe to one side it's likely you will have flaws in your stroke that are related to doing so, these might include lifting your head to breathe, pressing down on the water during the catch (like Joel) or crossing over in front of the head. Even though breathing to your 'bad side' feels awkward, your stroke technique to that side is probably much better than you think - in a sense it's a "blank canvas" without any bad habits that you can work from. An ex-elite swimmer who speaks excellent English, book in for a video analysis consultation with Gabi if you're in Prague on business. 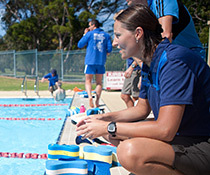 Or join her for any of her coached training groups throughout the week. Emma runs a fantastic open water venue on beautiful Lake Windermere and also offers full video analysis consultations locally. Wherever you are in the North West, there's now an even bigger incentive to visit the lakes! Within easy reach of both Glasgow and Edinburgh, Alan can offer you full SS video analysis, SS squads and in the summer months open water skills training. We get so many emails from Scotland asking for Swim Smooth coaching - now your prayers are answered! Gabi, Emma and Alan are all experienced coaches in their own right but have been working extremely hard towards their certification over the last 18 months. Each has been personally trained by Paul Newsome and Adam Young, including intensive training with our squads in Perth. Paul and Adam are very proud of these three excellent coaches and warmly welcome them to the team. Since we launched our certified coaches in the UK 12 months ago demand for their services has been overwhelming. Make sure you book up for a video analysis session or clinic with your local coach soon, they are all extremely busy in the build-up to the summer triathlon and open water season and consultation slots are filling up fast. 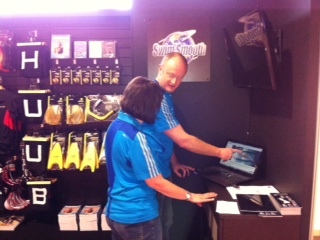 Don't forget we're at the triathlon show at Sandown Park, London today, Saturday and Sunday. Full info and details of our seminars are here.